I saw this idea on Facebook a few days ago and really wanted to try it, so this was our craft table activity at Twins Club today. Paint the palm of your hand with the chosen colour for the body of your caterpillar and your fingers another colour for the legs. 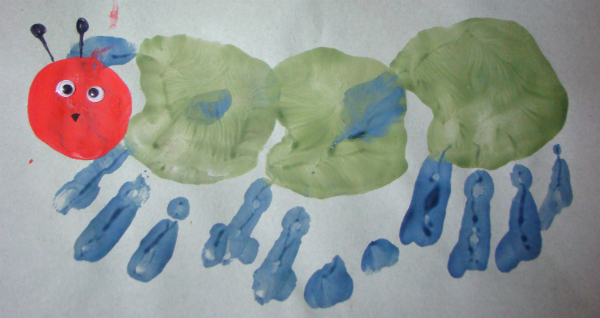 Print a line of hand prints along the paper to form the body and legs of the caterpillar. Make sure the prints are touching or overlapping. We did three prints, but you can do as many as you want. Use the circle stamp/bottle lid to print a head at one end. Once the paint has dried add a nose and antennae and glue on some googly eyes. Awesome! I posted this on FB too, but I haven’t had a chance to try it yet. Just adorable! It’s lots of fun to make handprint/fingerprint artwork! Yes, we love it 🙂 The kids want to do lots of handprint animals now so I think that is tomorrows plan!